is the bright nebular complex at center. A mere 1,000 ly from Earth, it consists of blue reflection nebulosity and many firey-red, Herbig-Haro objects which indicate active star forming regions. As such, NGC 1333 contains hundreds of stars less than one million years old- mere babies in astronomical terms. 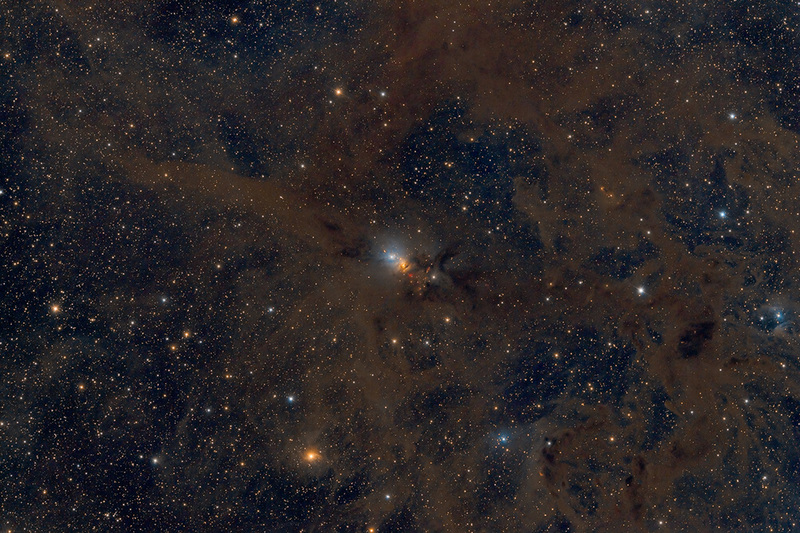 The associated Perseus OB2 molecular dust cloud complex seems to go on forever! Two other blue reflection nebulae can be seen near bottom and at 3 o'clock. Another lovely area of interest is the yellowish nebula surrounding the star HD 21110 above 7 o'clock. This is the first collaboration with my friend, imager and golfer extraordinaire Jimmy Walker whom I am grateful to for data acquisition.